Cpl Leland P. Peebler (BT)(KIS), Cpl David A. Costa (WG)(KIS). Cpl's Peebler and Costa bailed out of their B-17 near Presque Isle, Maine while en route to England on 1 September 1944. They landed in the middle of a lake and drowned. The other enlisted men also bailed out and survived. Reason for the bail out is not known. 258 (17 Oct 1944), 259 (A), 260, 261, 263, 264 (AS), 265, 266, 267, 268, 270, 271, 272, 273, 274, 276, 279, 280, 281, 282, 284, 285, 286, 288, 290, 292, 294, 297, 298A, 298B, 301, 308, 309, 310, 311, 312 (06 February 1945). For Mission dates, targets and Mission Reports, see Combat Missions. (A) Non-credited aborted mission - Ball Turret improperly operated. (AS) Credited abortive sortie - Unable to drop bombs. Bombs returned to Molesworth. 1Lt Joe B. Arwood (P) - 35 credited combat missions flown. First missions flown as CoPilot with a combat Orientation crew, 2Lt Eugene R. McCutcheon Pilot. All other missions flown as First Pilot. Three missions flown with substitute CoPilots: 259 (Abort), 298A, 312. Completed combat tour on 6 February 1945 (Mission 312). 2Lt Walter E. Johnson (CP/P) - 35 credited mission flown: 32 with 1Lt Arwood (All Arwood missions except 258, 259 (A), 298A, 312); 1 with 1Lt Frank Juns (259), 2 missions as First Pilot (298A, 299). Completed combat tour on 3 February 1945 (Mission 311). 2Lt William C. Fowler (N), S/Sgt James B. Linn (WG), S/Sgt Crispin E. Sanchez (TG) - 35 credited combat missions flown: 34 with 1Lt Arwood (All Arwood missions except 258); 1 mission with 2Lt Donald L. Telford (299). Completed combat tours on 6 February 1945 (Mission 312). The 1Lt Arwood crew flew with a nine man crew with one Waist Gunner on all of their combat missions. F/O Clarence L. Counsell (B)(WIA) - 9 dispatched (8 credited) missions flown - All with 1Lt Arwood (259 (Abort), 260, 261, 263, 264, 265, 266, 267, 268). On mission 268, 5 November 1944 to Frankfurt, Germany, 2Lt Counsell was hit in the chest by flak. The flak bounced off his protective flak vest into his left arm, throwing him into temporary shock. 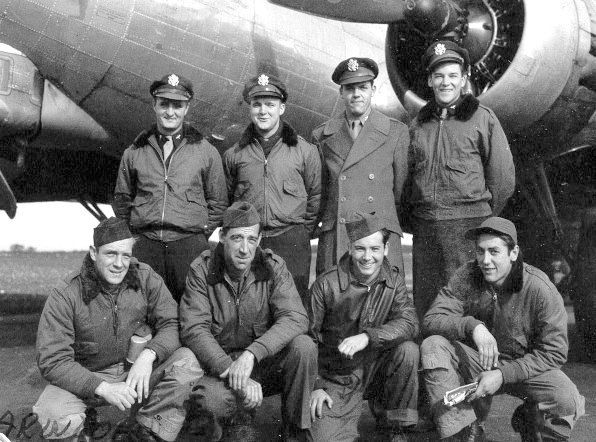 He managed to get back to his bomb sight and release the B-17's bombs with his right hand. The minus 60 degree temperature kept him from bleeding to death. A shot of morphine, administered by Navigator 2Lt Fowler, controlled the pain. 2Lt Counsell was awarded the Silver Star Medal for his heroic action in getting bombs away and was promoted to 2Lt. He was hospitalized upon return to Molesworth and removed from combat duty status. Substitute Bombardiers and Toggliers were used by the 1Lt Arwood crew on its missions after mission 268. T/Sgt Thomas B. Power (E) - 35 credited missions flown: 29 with 1Lt Arwood (All Arwood missions except 282, 284, 285, 286 and 288 where substitute Engineers were used); 6 with other Pilots - 2Lt Donald L. Telford (299), 2Lt Merrill M. Silver as Waist Gunner (316), 2Lt John M. Armfield (317, 318, 319), Lt Col William C. Sipes, 41st CBW in a Scouter B-17 (327). Completed combat tour on 1 March 1945 (Mission 327). T/Sgt Paul A. Curry (R) - 36 credited missions flown: 33 with 1Lt Arwood (All Arwood missions except 258 and 259); 3 with other Pilots - 2Lt Donald L. Telford (299), Capt Harold L. Stouse (Lead crew mission 317), Maj William C. Heller (Lead crew mission 318). Completed combat tour on 20 February 1945 (Mission 318). T/Sgt Charles L. Gerstel (TOG) - 35 credited missions flown: 19 with 1Lt Arwood (273, 279, 280, 281, 282, 284, 285, 286, 288, 290, 292, 294, 295, 297, 298A, 298B, 301, 309, 310, 311); 16 with 13 other Pilots - As Waist Gunner (256, 271), As Tail Gunner (334), As Togglier (295, 299, 308, 312, 323, 329, 330, 337, 341, 342, 344, 347, 348). Completed combat tour on 30 March 1945 (Mission 348). Six other substitute Toggliers and Bombardiers used on other 1Lt Arwood missions after Mission 268 when 2Lt Clarence L. Counsell (B) was wounded and removed from the 1Lt Arwood crew. S/Sgt Joseph P. Hulterstrum (BTG) - 35 credited missions flown: 19 with 1Lt Arwood (276, 279, 282, 284, 285, 286, 288, 290, 292, 294, 297, 298A, 298B, 301, 308, 309, 310, 311, 312); 16 with 4 other Pilots - 1Lt Thomas H. Gardin, Jr. (273, 274, 277, 278, 280, 281), 2Lt Donald L. Telford (299), 1Lt Ben L. Connelly (300), 2Lt Roy F. Statton (313, 314, 315, 316, 318, 319, 320, 321). Completed combat tour on 23 march 1945 (Mission 321). Other substitute Ball Turret Gunners used on other 1Lt Arwood missions. Mission 282, 4 December 1944, to Soest, Germany. The 1Lt Arwood crew was on of 15 crews who landed their B-17s at Airfield A-70 at Laon, France to replenish their gasoline. Formations were delayed for over and hour resulting in unexpectedly high gasoline consumption. Crews returned to Molesworth on the next day, 5 December 1945.